They reckon 78% of omelettes become scrambled eggs at “flipping” time – don’t become another statistic folks. Be patient with cooking the underside of the omelette, make sure it’s cooked and not sticking then you’ll be good to go. In a fry pan heat the fat and add the onion and chilli. Cook on a medium heat until the onion begins to soften and then remove from the heat and set aside. Add some more fat to the pan if necessary and throw in the chopped kale. Toss gently until the kale begins to wilt and soften and remove from the heat and set aside. Lightly beat the eggs in a bowl and pour into the pan. After 30 secs cover half the eggs with the onion, chilli and kale. Cook for a 2 minutes or until you can lift the eggs with a spatula with ease (without it losing integrity). 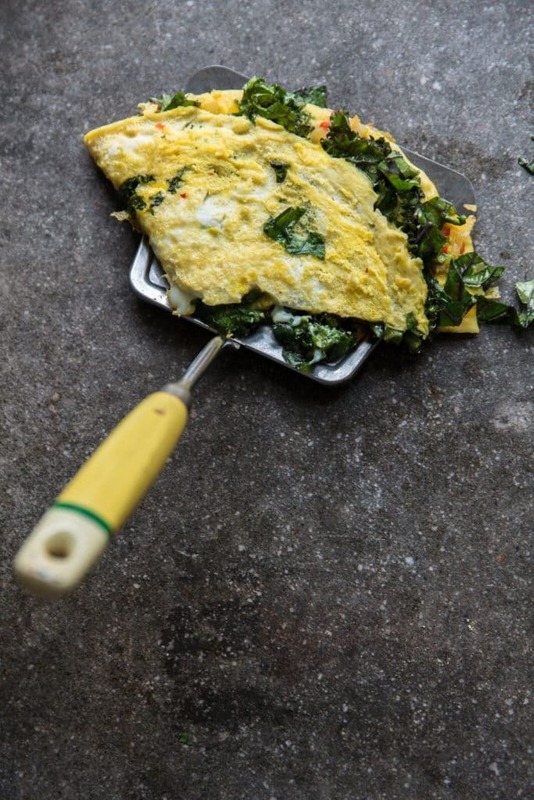 Lift the omelette opposite the kale/chilli/onion and flip it over to cover and continue to cook for 1-2 mins or until cooked to your preference. Remove from the heat, season, and serve.